Washington, January 24: We have heard that due to severe cold lakes freeze, small ponds freeze but this is a bit new to eyes that the whole waterfall freeze. One of the biggest waterfalls, Niagara Falls of has frozen out due to extreme weather conditions. The winter storm that has blanketed the Midwest in snow and turned the Northeast into a deep freezer has now brought the falls' rushing waters to a halt in places. 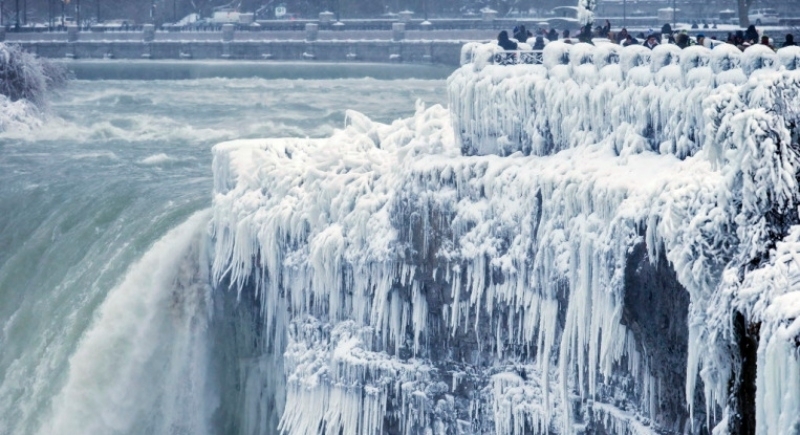 The Niagara Falls region is expected to be coated in snow for the next few days, with the area bracing for more storms. On Wednesday, a Canadian weather alert warned of a "band of snow mixed with ice pellets" which was expected to mix with "freezing rain". "Freezing rain warnings are issued when rain falling in sub-zero temperatures creates ice build-up and icy surfaces," the alert said. About 2 to 5 centimetres of snow, considered light snow by the Canadian weather bureau, was forecast, along with temperatures that felt like -5 degrees Celsius. Contributing to the icy vista was a weather system moving over North America from west to east, which the US National Weather Service said was strengthened by Arctic air from Canada.